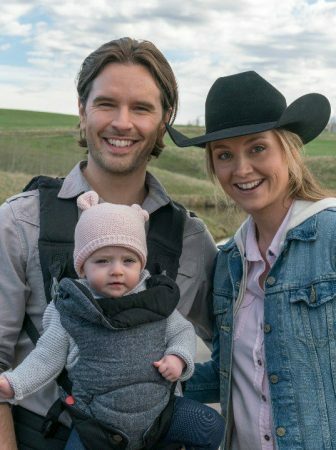 This Heartland season 11 penultimate episode brought us three big storylines that covered everything from cyberbullying to business deals and house building. 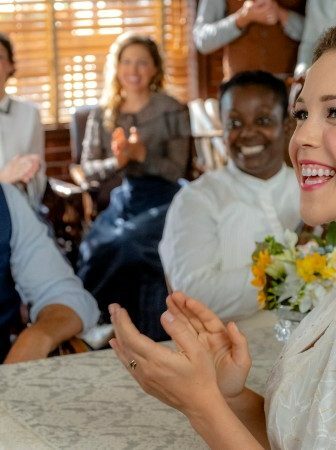 So as we wait for the Heartland season 11 finale this Sunday, let’s check out what happened in Heartland season 11 episode 17. 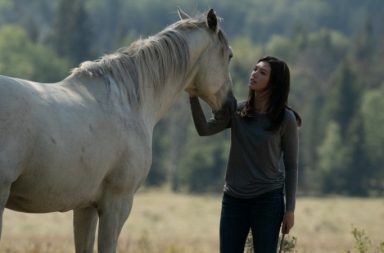 The first big storyline of Heartland season 11 episode 17 was a continuation of a character arc that has been running all through this Heartland season. And that is of Georgie trying to break into the jumping community and all the hurdles she has to overcome to do that. On the last episode, we saw Phoenix getting hurt when Georgie tried to jump over an especially high jump. And even though Phoenix was all right in the end, he just needed a few extra days to recover and heal, the video of Georgie’s fall was posted online. Generating some nasty comments about Georgie and her treatment of her horse. Which left Georgie devastated. And on this episode, we saw the aftermath of that. Because during the course of the episode we saw Georgie not only trying to run away from her problems by asking Lou to move to New York with her. But also trying to figure out who posted the video online. Yet Lou was smart enough to convince Georgie that moving to New York wasn’t the best idea. And with the help of Dylan Georgie also figured out who exactly posted the video. In the end, it turned out that Peyton was the one behind the video that caused so much pain to Georgie. And although Dylan helping Georgie figure that out did result in Georgie and Wyatt breaking things off, the knowledge of Peyton’s betrayal helped Georgie find her resolve again. Resolve to compete in the Fall Finale and show everyone just what kind of competitor she is. 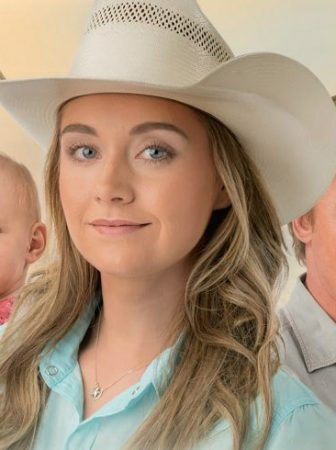 So I have a feeling that in the Heartland season 11 finale we might be treated to a focused and determined Georgie and a fierce competition. The second storyline of this episode focused on Mitch, Tim and Jack and an exciting business opportunity for the business partners. 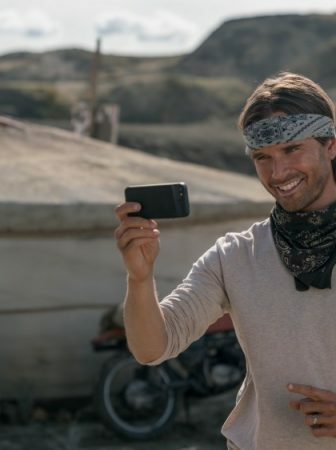 Because on Heartland season 11 episode 17 we saw Mitch present the two older men with an opportunity that could lead to a bright future for their cattle business. At the start of the episode, we saw Mitch tell Jack and Tim that while eating breakfast at Maggie’s he met Fred Garland, the CEO of Garland Foods aka biggest grocery store chain in Calgary. And that Fred wants to do a partnership with Heartland Ranch. Which got all three of them excited about the possibilities that this partnership would bring. However, once it was time to talk about who would be attending the meeting with Fred, Tim insisted that he join Mitch at the meeting. Mitch, of course, disagreed, wanting to do it on his own. And with Jack’s support, they decided that Mitch will go meet Fred alone. However, things didn’t quite go as smoothly as Mitch had hoped for. First, he asked Lou for business advice and got more than he bargained for with Lou rattling down advice faster than Mitch could write it down. And then Tim showed up for the meeting unexpectedly, causing them to get into an argument in front of the CEO and Fred to reconsider the deal. 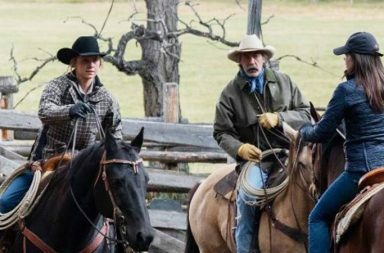 Luckily, Jack saved the day by later calling up Fred, showing him around Heartland and explaining to him that although Jack, Tim, and Mitch might not see eye to eye all the time, they are still a family business that knows how to raise quality cattle. And they struck a deal no doubt setting the trio on a brighter, more profitable path. 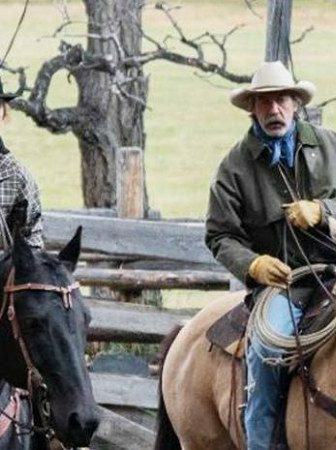 While the final big storyline of Heartland season 11 episode 17 was all about Ty and Amy trying to figure out what to do with the land that Jack gave them in the last episode. The stunning opening shots of the episode were of Amy showing Ty the piece of land that Jack bequeathed them. And right off the bat, Ty was voicing his opinion on how much they could do with the property. A house with a big yard was among Ty’s wishes. Yet, because of Ty’s excitement, Amy didn’t tell him of her wish to raise Lyndy at the ranch house. Instead of building their own house. And after Amy finally did tell Ty that she had reservations about not raising her daughter at the main house she and Ty were at odds of sorts. Because Ty wasn’t too keen on the idea of living in the ranch house. After all, he wants to start their own traditions and live in their own house. So not being able to come to a compromise, they decided to table that discussion for later. Meanwhile, Ty decided to try and show Amy what living in a home of their own would be like by hanging a swing on their land and telling Amy of what their life could look like if they did decide to build a house on their new property. And this gesture combined with Lou’s advice of keeping an open mind was what swayed Amy to agree with Ty’s idea of building their own house. Someday at least, when they have enough money for a down payment. Because as of right now Amy and Ty decided to enjoy their lives together and spend as much time as they can with Lyndy. I couldn’t help but see the resemblance between the scene of Georgie tacking up Phoenix at the end of this episode and the scene of Amy tacking up Spartan that plays at the beginning credits of every episode. Which left me wondering if the sequence with Georgie has a bigger meaning behind it. Or if I am just imagining things. What do you think? 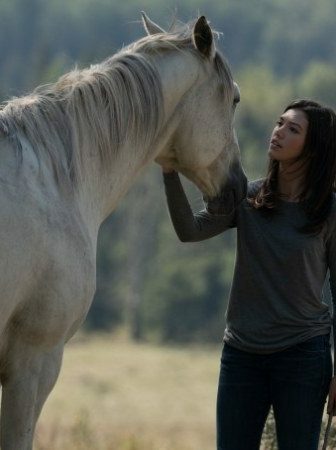 Also, I just wanted to commend Heartland for deciding to do a storyline about cyberbullying. Because it is an important topic that needs to be discussed and addressed. And since Heartland is a family show watched by many family members together, it can easily open up a discussion between parents and children of what to do if they are getting bullied online. 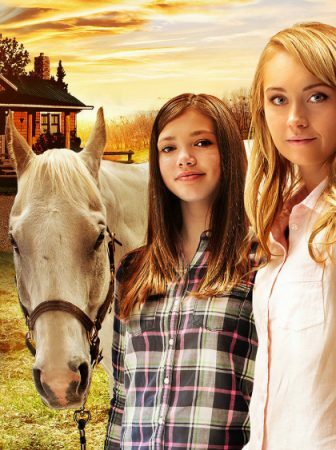 And lastly Heartland season 11 episode 17 truly was one that brought big steps for most of our characters. Georgie decided to compete in the Fall Finale. Jack, Tim, and Mitch got a huge business deal for their cattle business. And Amy and Ty decided to one day build a house of their own. Which makes me wonder if these big steps are setting our characters on new paths. And with the Heartland season 11 finale airing this Sunday, it might as well be true. 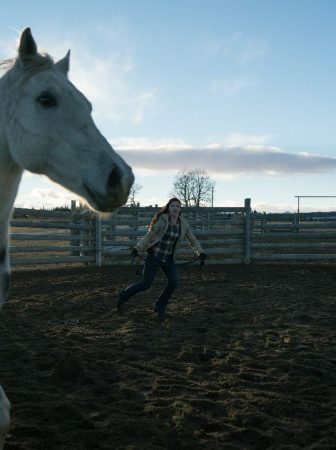 I guess we just have to wait and see what happens in the last episode of Heartland season 11. Is there any news on a season 12 and will i focus so much on Georgie and her episodes. Almost seemslike to meit's becoming the Georgie Fleming -Morris and the teeny boppers show. Where's Lisa and Scott. Caleb and Cass tired of the teenagers. 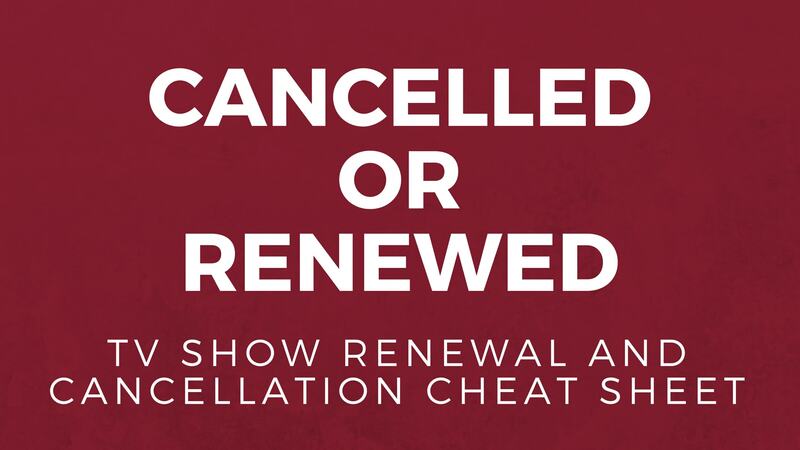 No news yet on season 12. But they will probably announce it within the next few days since the season 11 finale is this Sunday!